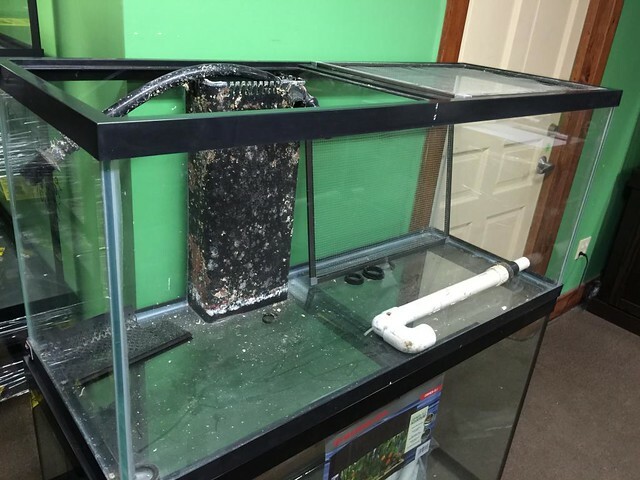 This is a journal of a 75 gallon build, highlighting a DIY stand and sump. 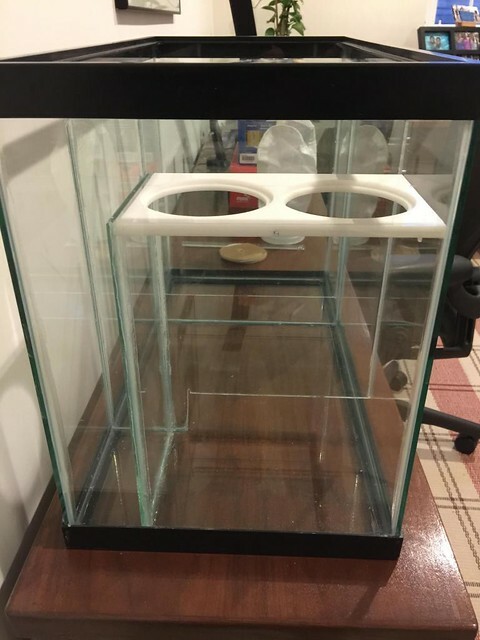 Having had two all-in-one tanks, this is my first tank with a separate sump. Last edited by rmchoi; 12/28/2017 at 09:03 PM. 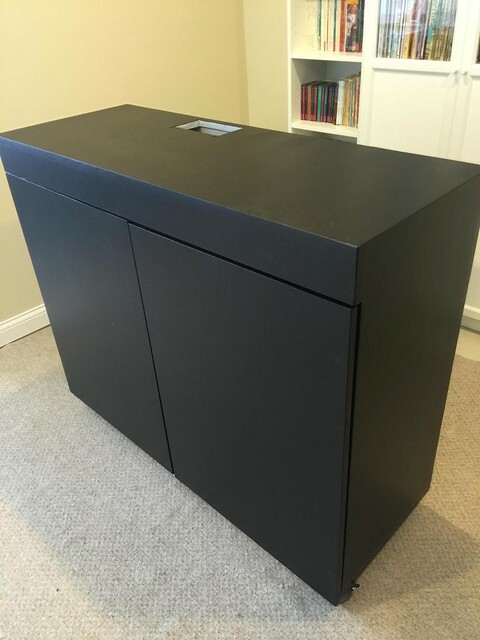 The previous tank was a black European modern style cabinet. I decided to go with that style again. The location near the stairs limited the tank size. 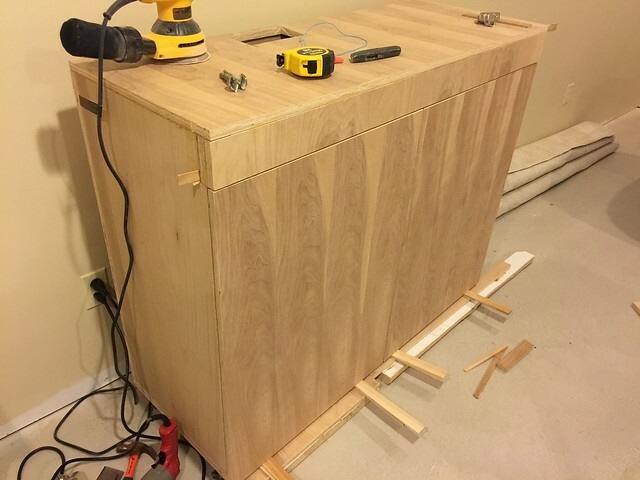 To maximize the inside cabinet space, I decided to go with plywood construction, in lieu of 2x4 framing. used heavy duty casters rated 300 lbs. Lastly, I wanted a taller tank display to avoid leaning down to view. Last edited by rmchoi; 12/29/2017 at 01:08 PM. I used two 4 x 8 sheets of 3/4" birch plywood for the stand. After making all the cuts, only a few scraps not used. 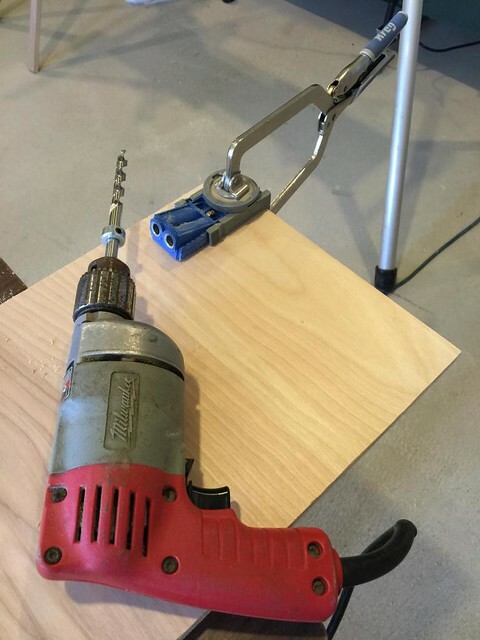 Used a Kreg pocket hole jig. 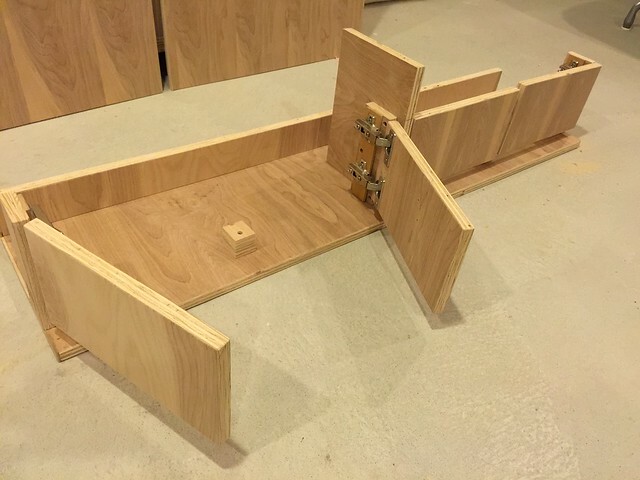 This is a great tool for assembling wood joints. On back panel, I cut out large oval openings for cords and ventilation. In the past, I have experienced frustration because openings were to small from so many cords. This time I made big openings to pass through equipment and for airflow. Last edited by rmchoi; 12/29/2017 at 01:15 PM. Location: The Salty D! Sandy let go of my eggo! Great start so far! Nice to see stand that's not made strong enough to support a battle ship. Fish tanks and Chevys... And my cousin's Datsun too. Some call it paranoid. I call it prepared. You have more post than I do... You MUST be right then! Lots of thought to the equipment layout in the stand, especially managing the cords. I wanted the cords to be out of sight, but not so difficult to unplug and remove equipment for maintenance or replacement. In my last tank, I had cords organized bundled neatly with plastic ties, mounted on the side walls or ceiling of the stand. It looked nice until I had to unexpectatly remove one piece of equipment. this ended by cutting every tie to find and remove one cord. 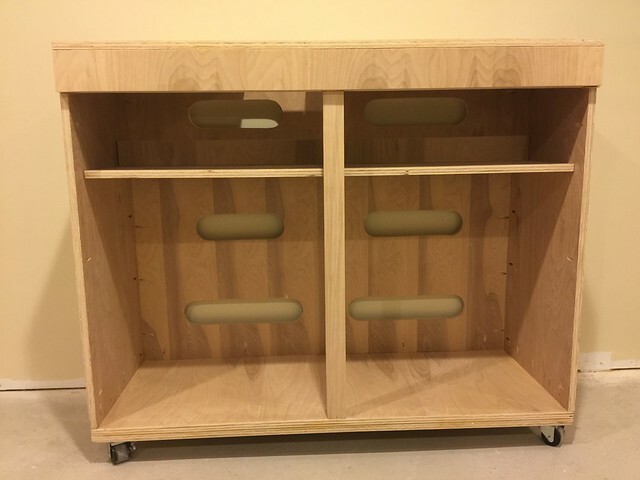 Equipment tray with access from front and rear. 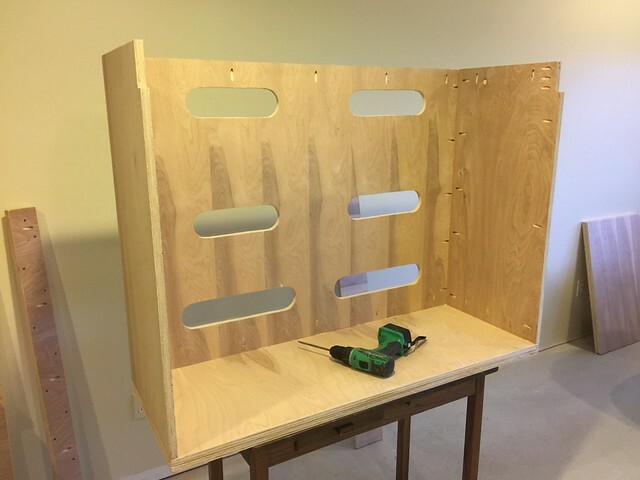 Since the stand is taller and made of plywood, the equipment tray provides added side to side lateral bracing. 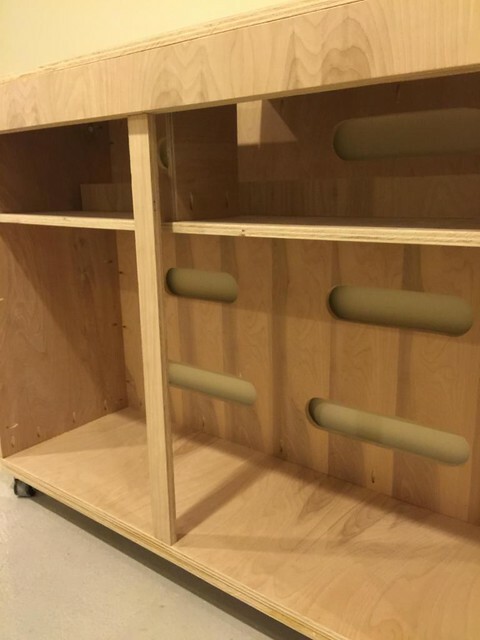 Front doors of the equipment tray open. The tray does not extend all the way to the back panel, leaving room for plumbing. 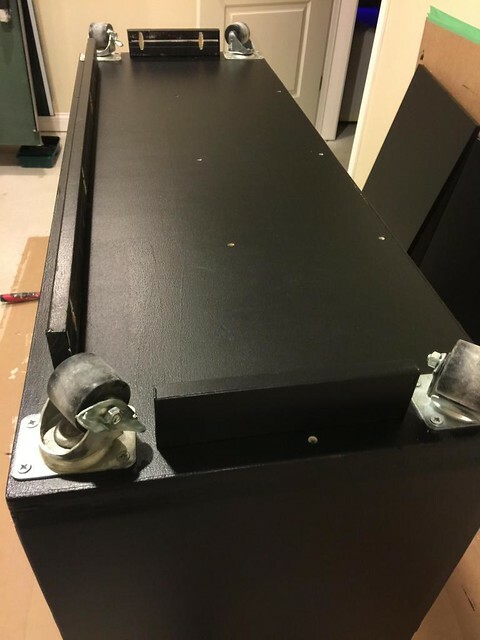 There is a vertical lip on the back of the tray to mount the Apex Energy bar. The top holes in the stand's back panel match the tray height for easy access. Last edited by rmchoi; 12/29/2017 at 01:26 PM. Earlier I mentioned the stand will be on wheels. This was not my preference, but I knew the tank would need to move a various times for various reasons. I can move the tank in any direction, front to back or side to side without having to break down the entire tank. For this, I used low profile wheels, rated at 300 pounds each. 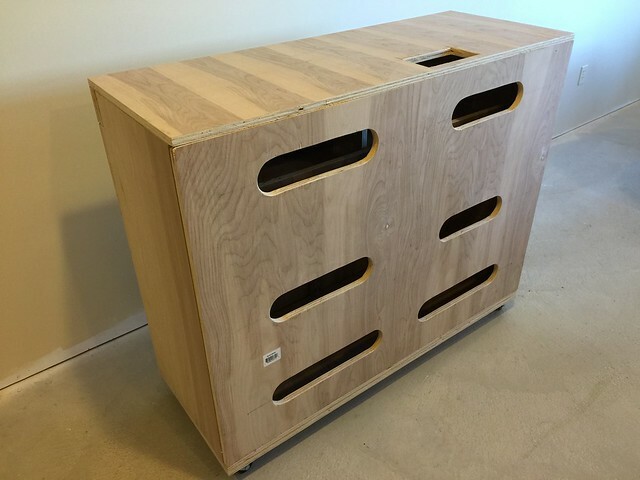 The stand floor was built with two layers of plywood for added support for the wheels. 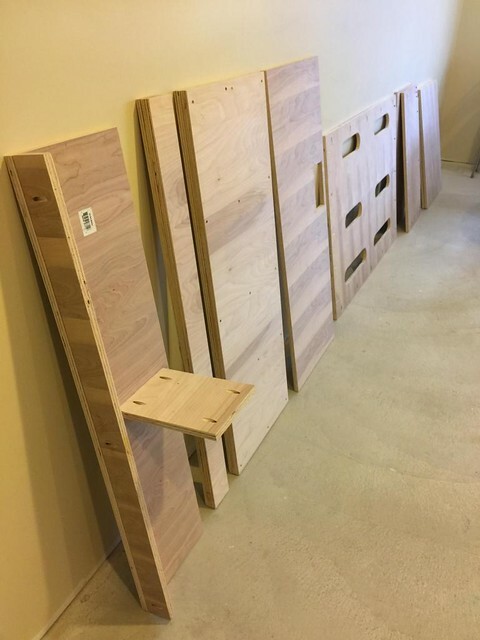 Finishing the last stand doors with European frameless cabinet hinges. I was concerned about carrying the weight across the front. For this, I made a wood beam, made out of two layers of plywood, glued and screwed together. I added a center post to over engineer it. Its not needed; its a security blanket. 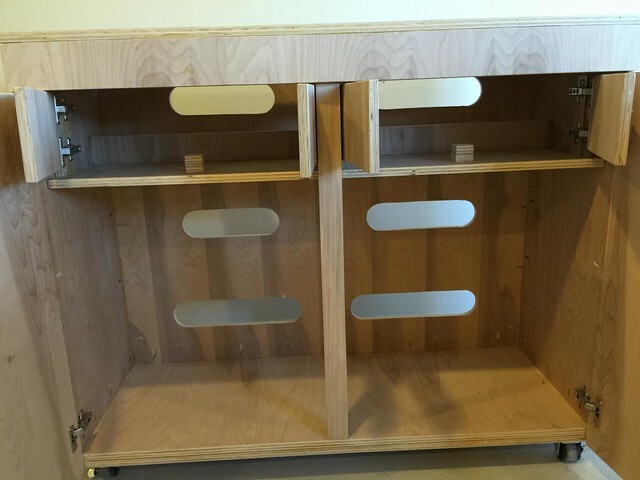 This is the final cabinet with the pieces assembled, including the equipment tray. 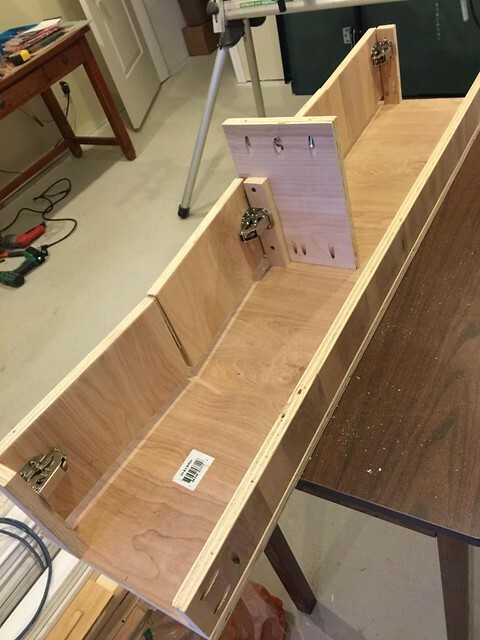 3/4" plywood was the only material used, besides the hardware. I will add a toe kick between the wheels in the front and sides to finish it off. Last edited by rmchoi; 12/29/2017 at 01:35 PM. looks like a very high-quality build! 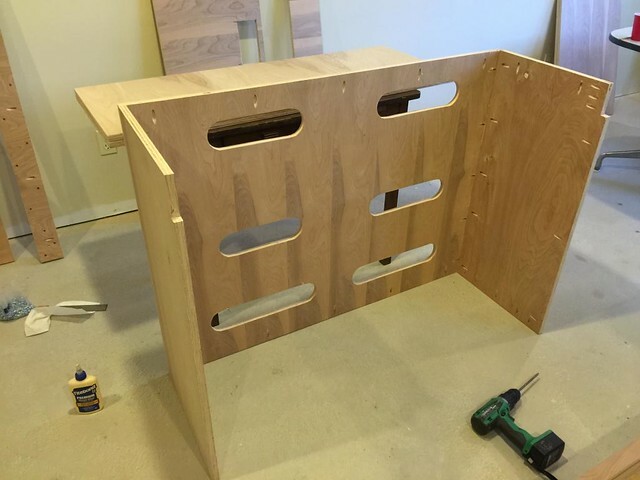 you save a ton of internal space with the plywood design. I'm not too crazy about the wheels, but I assume you had no choice. It was a struggle how to finish the stand. 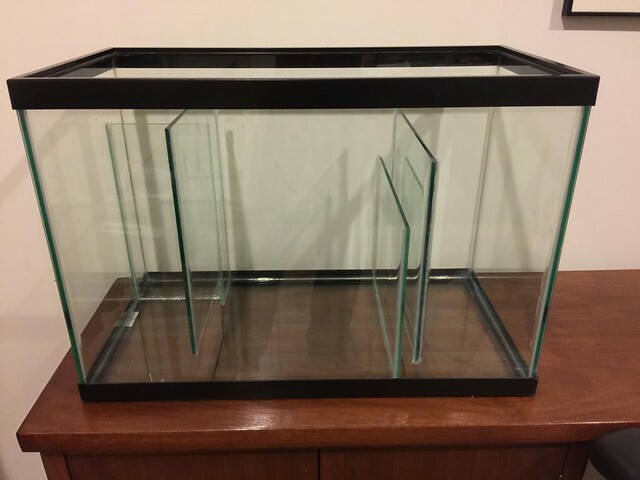 Since this is standard tank with black plastic trim tom and bottom, black would be the best color to keep blend the trim into the big picture and keep from standing out. The finish had to be easy with no shading between coats. My solution using a metal paint with an oil base primer. 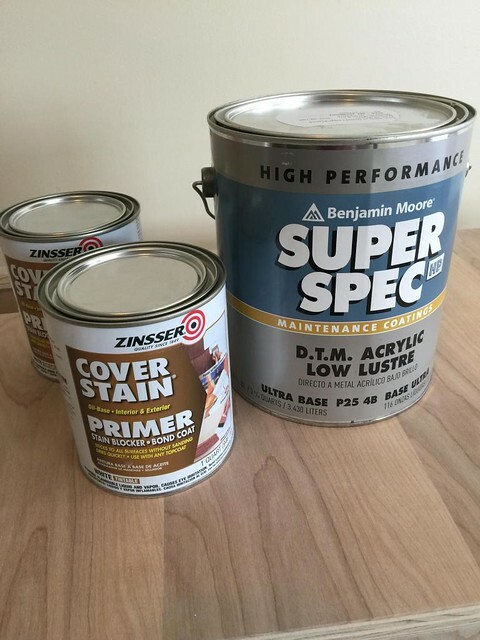 Oil based primer and paint. Fortunately, the stock black paint color ended up matching the black trim on the tank. 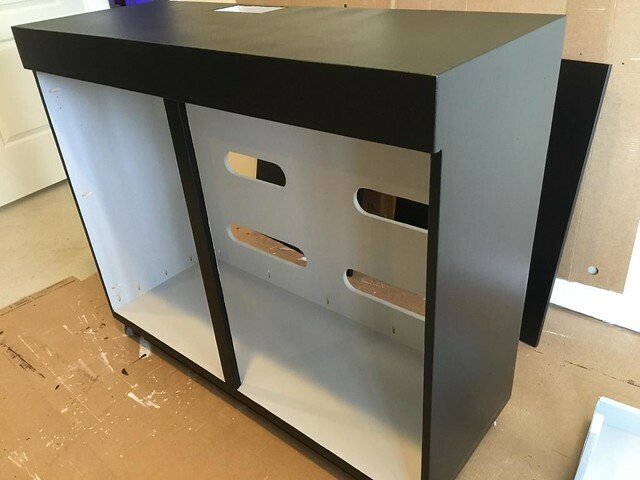 The back of the stand finish painted. The bottom of the stand finish painted, including the toe kick boards between the wheels. I ended up going with a light gray interior, which actually turned out okay. Last edited by rmchoi; 08/24/2017 at 06:24 PM. Here are the finished pictures of the stand. 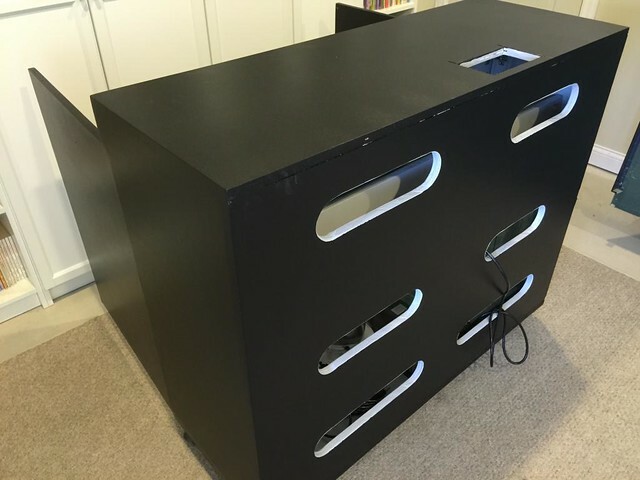 The black finished stand with the doors. Last edited by rmchoi; 08/24/2017 at 06:27 PM. reefmad619 —Thanks for noticing the build. Very limited tools turn this into a harder project than it should be. 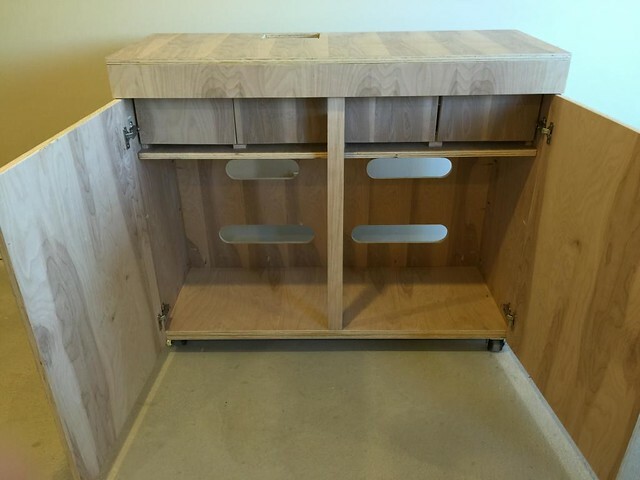 The extra space in the cabinet is nice, but you will see the space needs when it is stocked. I am also with you on boycotting the wheels. The adjacent room is a furnace room. If I need to move a HWH or furnace, I will be glad the tank is movable. rwb500 —Appreciate the encouraging words. My gut says to build it to support a battleship, but I see commercial stands, for tanks twice this size, made with 3/4" plywood. Last edited by rmchoi; 08/24/2017 at 06:28 PM. i would lose the wheels, from all of my reading here its a very bad idea to move a tank with water in it. Very nice build. Love the clean lines of your stand! I'm curious to see how you utilize equipment tray once your further into setting up your system. I design the top half. I like the way you have the stand built. I love Kreg units and own two myself. My first concern is that you won't have enough room for the skimmer, either removing the cup or with getting the pump out for cleaning. If you have enough room for that, you should be good. I have three problems with your wheel theory. My first is that you would move the tank for a furnace or HWH replacement/repair but those would have to go through the doorway. If you have room in front of the door anyways for accessing the furnace room, anything that would necessitate moving the tank would involve RIPPING OUT THE DOOR ! I don't know about you but if they were going to take a door out of the wall to fix something, either the door is the wrong size or I would want to move the tank away from the demo. The second counter to your moving the tank theory is that you're assuming you will need to move the tank at some point in the future. I would counter that by saying you are more likely replace the tank or have moved before you will need to do that kind of work on the furnace. Most furnaces and HWH will last decades, very few reef setups last that long. My third issue with the wheels is that they don't give you any way to level the tank easily. If there is a slope on the floor, the tank will not sit even which could result in things leaking or bending over time. 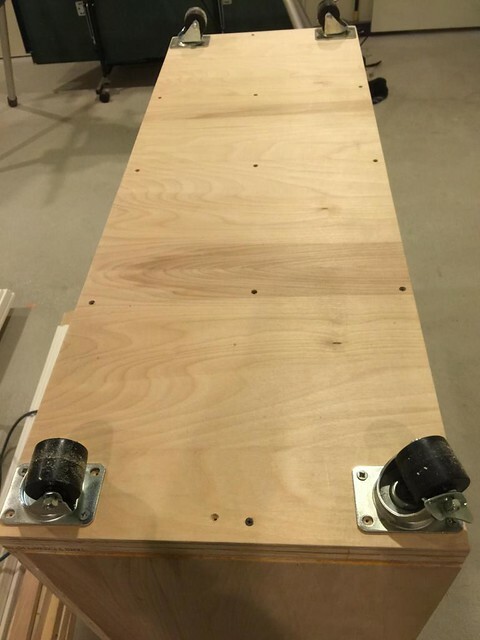 If you decide to remove the wheels I would recommend either placing the stand flat on the base sheet of plywood or to move the filler strips you have between the wheels out until they sit below the sides of the stand. You want the load to go straight from the top of the stand, down the sides, and into the floor. Having the toe kick is all well and good but it makes for a poor load path. The result is a very clean design. Looks good so far. Keep posting picks. I look forward to seeing how this progresses. RocketEngineer — Thanks for taking the time share your insights and details of the potential pitfalls! Frankly, I wish never to move the tank, but I know it will have to move a couple times, thus the wheels (over breaking down the tank). Last edited by rmchoi; 12/28/2017 at 09:12 PM. 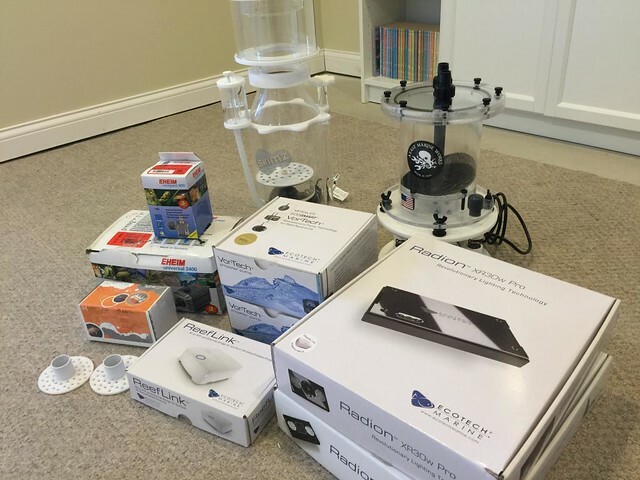 My goals was to have a sump with little water noise, splash free and easy to maintain. 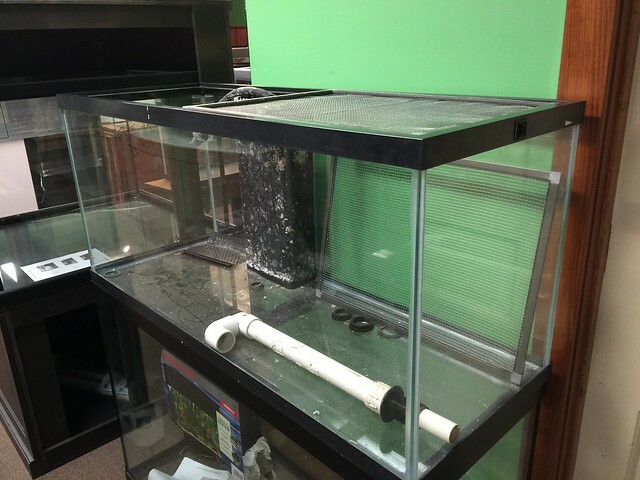 This design had four chambers; a drain, filter sock, skimmer and return pump. Although I would have like to go bigger, I used the smallest size I thought I adequate, to allow room for other equipment in the stand. I thought baffles could easily be done. 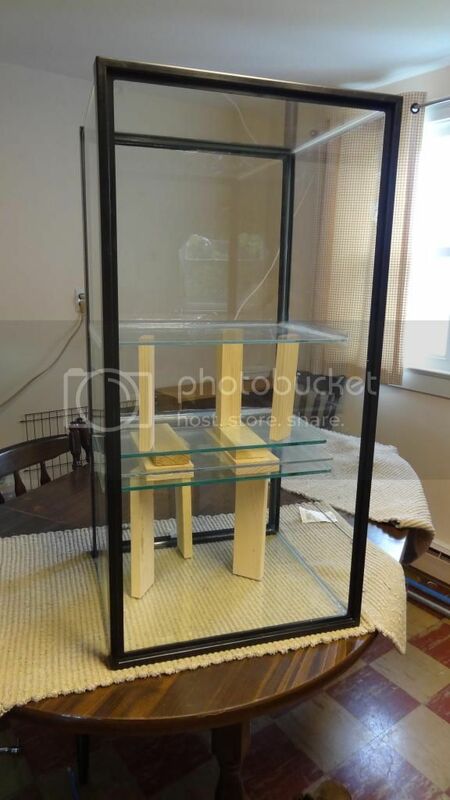 I read about those buying glass baffles from Home Depot. They would even cut it to size. I found stores only carry picture glass (1/10” thickness). Glass from glass shops were well over $100 polished. I even went to a thrift store and found glass that looked old, which turned out to be tempered. It exploded into hundreds of pieces when I tried to cut it. 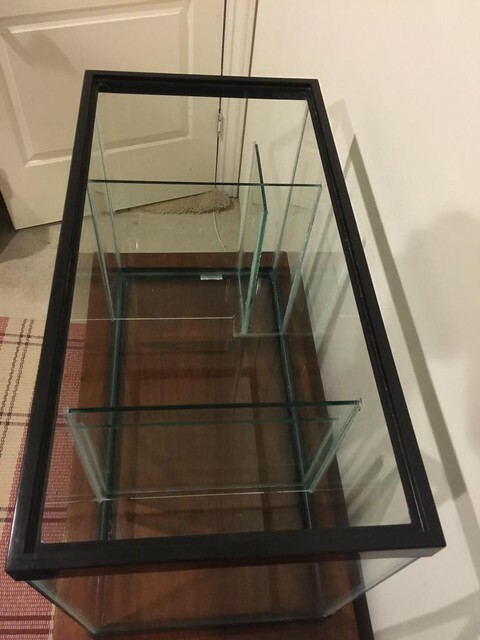 I finally found 3/16” plate glass on craigslist. 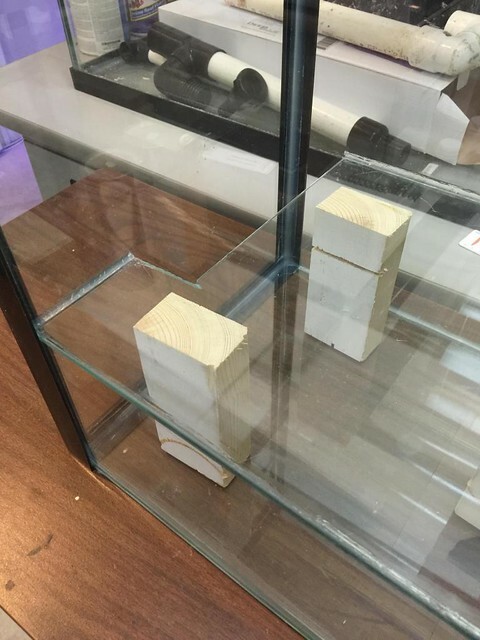 Cutting the glass was not that difficult. 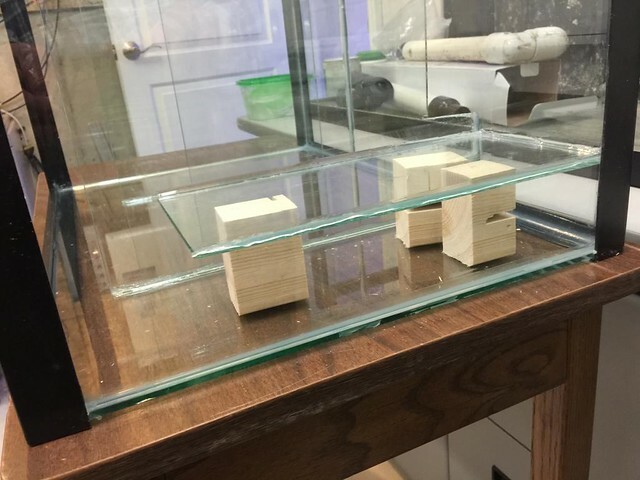 Once the glass was cut and edges eased with a sander, I wasn’t sure how to how best to hold the baffles in place and keep them square while caulking. 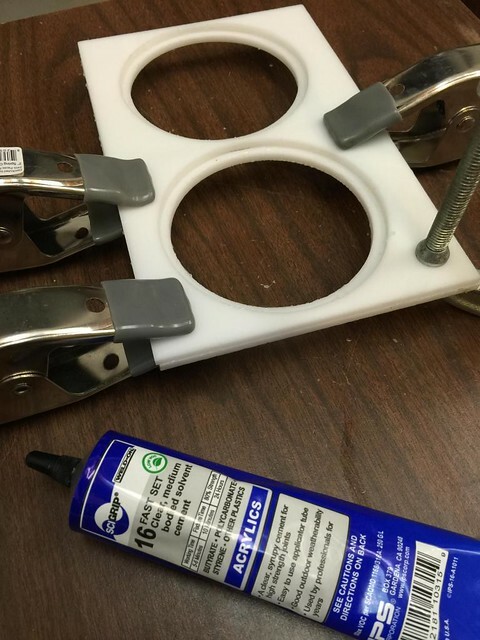 I saw all kinds of bracing methods online, but I found the easiest way was to turn the tank on end and use spacers. Gravity kept the glass panels square and made easy access for caulking. I used GE Silicone 1 for caulking. Placing the first glass baffle in place using wood spacers, ready to caulk. Caulking the next baffle into place with wood spacers. Last edited by rmchoi; 12/28/2017 at 09:13 PM. 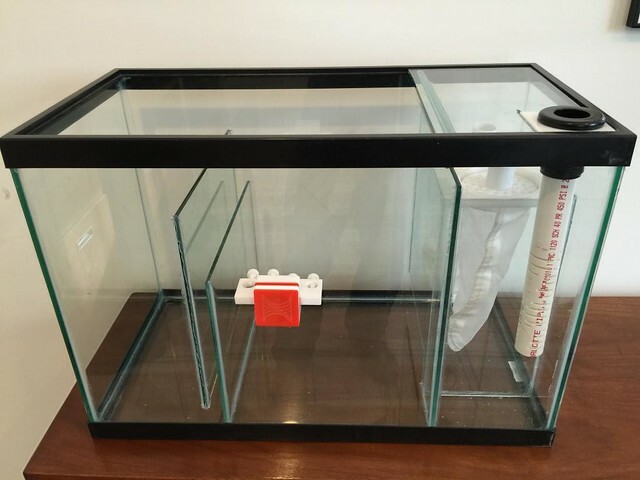 The most difficult glass cut was the divider between the filter sock sump and skimmer chamber; and the glass cover over the filter socks. 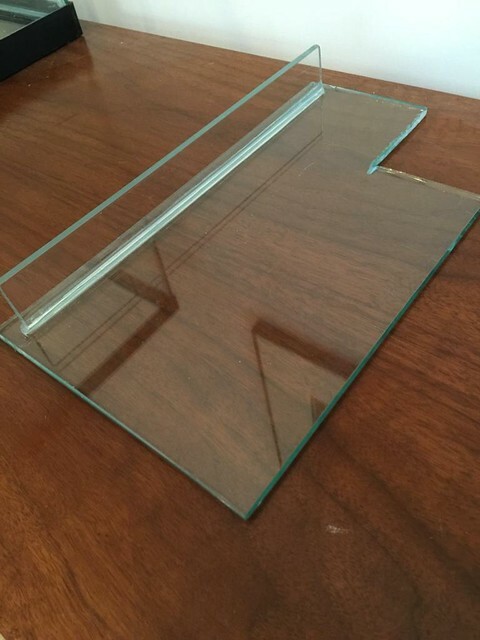 Both pieces required a square notch cut out in the corner of the glass pane. For the first side of the notch, I used a diamond blade on a hand grinder, with one of my kids spraying water to keep it cool. That was the most delicate part. The second side of the notch, I used a glass cutter which was easy in comparison. 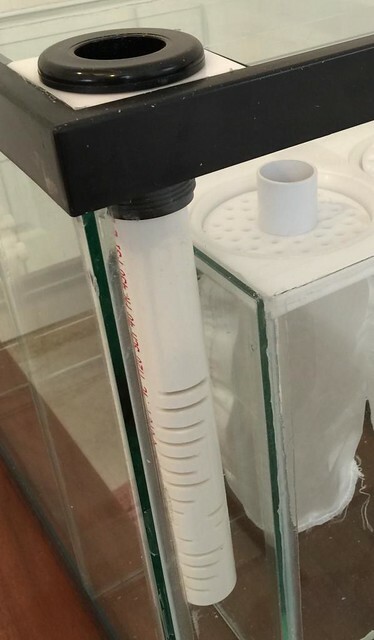 This is glass cover over the filter sock chamber to reduce splash and noice. Its notched around the drain pipe chamber. Last edited by rmchoi; 12/28/2017 at 09:15 PM. The silicone job looks very clean. Much better than I did on mine. 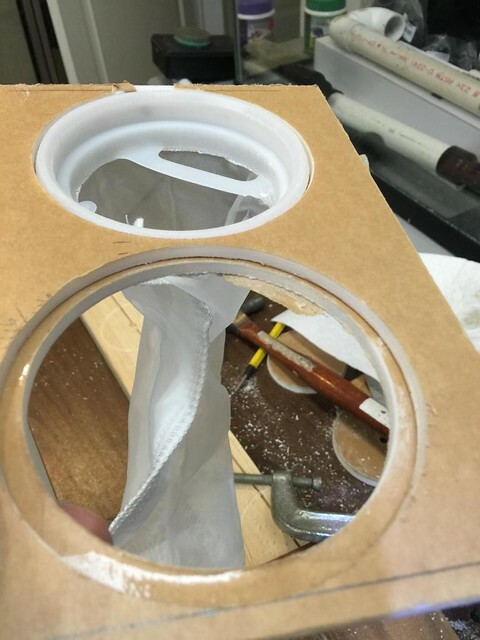 Setting and caulking the last piece of glass, dividing the drain chamber and the filter sock chamber. Last edited by rmchoi; 12/26/2017 at 03:14 PM. 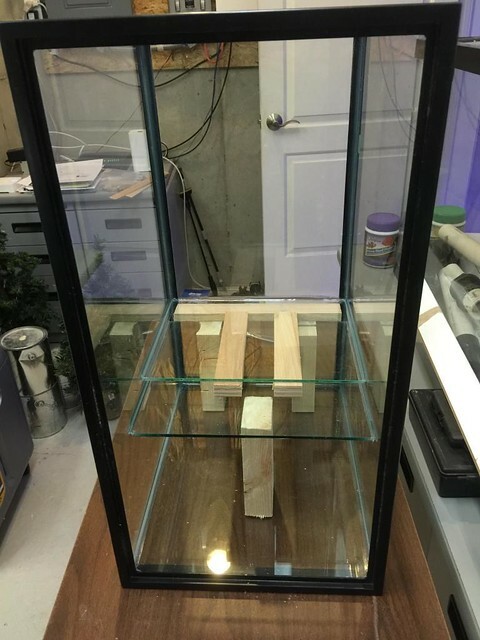 Here is the 20 gallon high aquarium with the baffles caulked in place. On this view, you can see the drain chamber (the smallest section at the top right corner) is sealed to the bottom on all 4 sides. Last edited by rmchoi; 12/26/2017 at 03:15 PM. 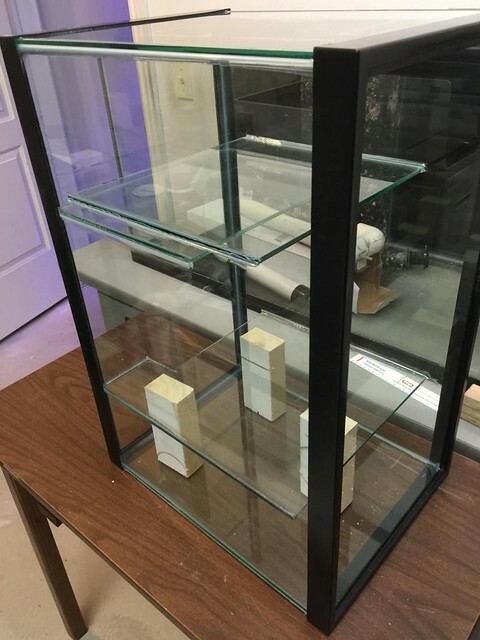 The filter sock holder consists of two layers of 3/16” acrylic sheet. 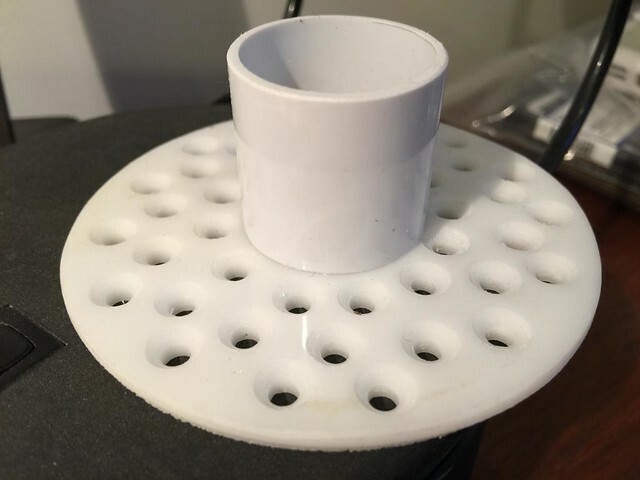 There are two different size holes in the top and bottom plate. The top hole allows the edge of the sock to sit lower than the top plate. The bottom plate creates a ledge that supports the sock. Together, the filter sock stays securely in place. It was difficult to get the top holes perfectly centered with the bottom holes. You may notice the hole at the bottom is offset. I had to cut the bottom section in half, then realign the holes before gluing. Here you can see the holes matching up, after sitting the bottom plate into 2 pieces. 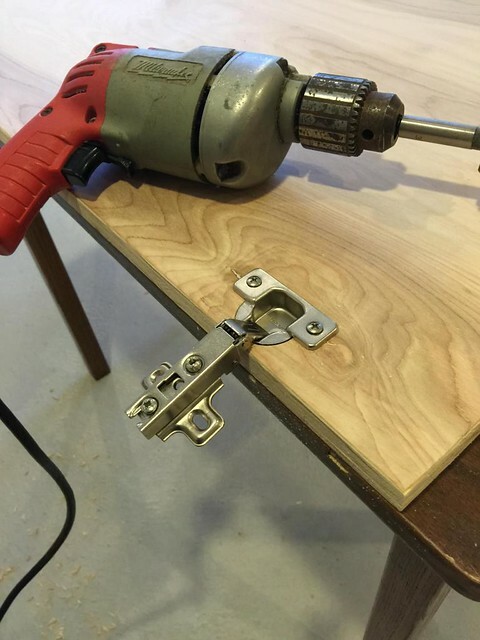 At first I was disappointed to have to cut the bottom plate to make this work. Then I realized the bottom plate would not be seen. The last step was to sand the edges and place the sock holder. 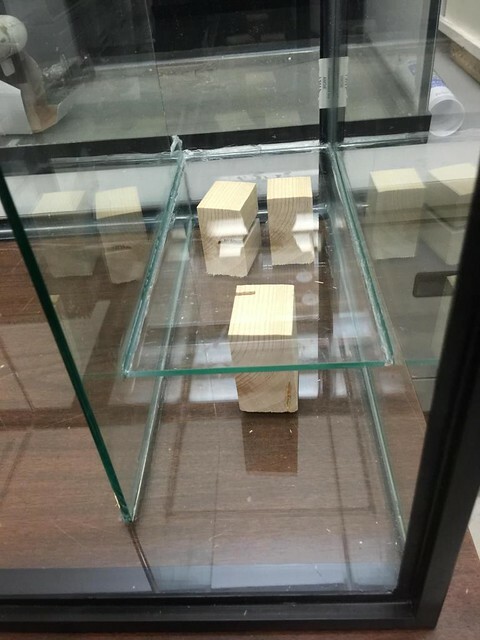 I ended up supporting the holder with wood supports and calking it in place. Last edited by rmchoi; 12/26/2017 at 03:20 PM. Here is how the sock holders turned out with the filter socks in place. 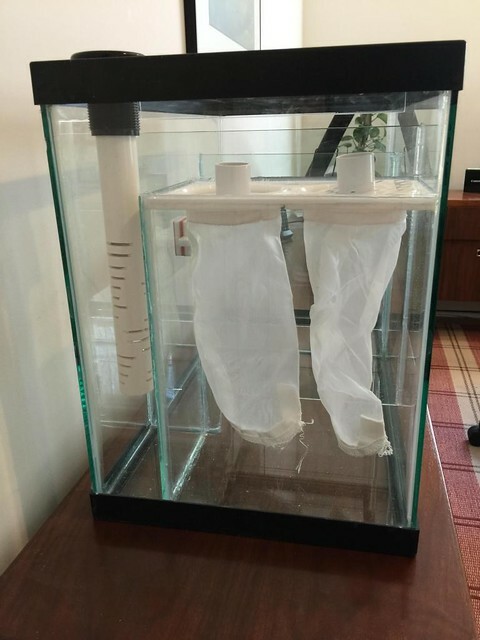 Using a 20 gallon high allowed me house the extra height in the tank to accommodate longer filter socks. Last edited by rmchoi; 12/26/2017 at 03:22 PM. I wanted to make sure the drain pipe was supported in place. For this item, I glued two layers of acrylic together. 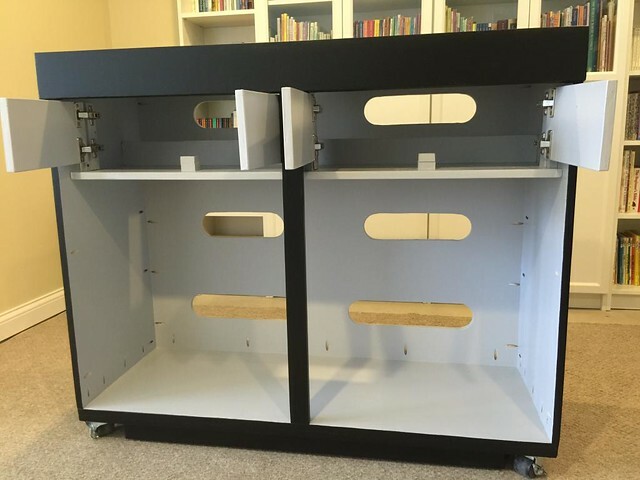 The bottom later was offset to accommodate the plastic lip of the black aquarium rim. I drilled a hold for the drain pipe bulkhead the siliconed it in place. This is the drain pipe holder siliconed in place with the glass cover notched out around it. Last edited by rmchoi; 12/26/2017 at 03:23 PM. I saw this item online called a sock silencer. It is designed to spread the water before it falls and reduce water noise. 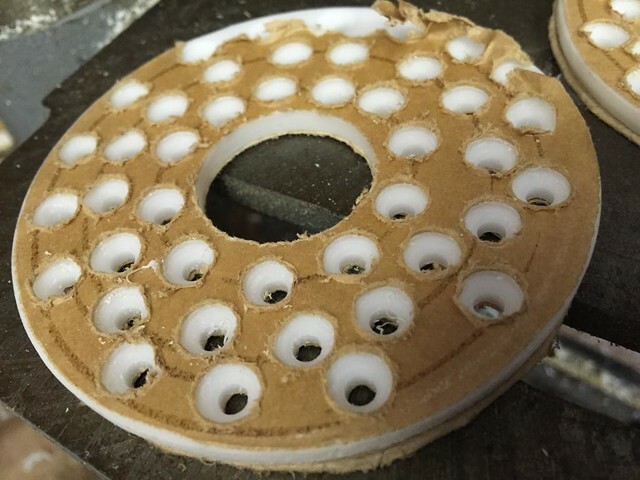 There is a 1 inch hole in the center that is designed as an overflow, if all the small drain holes plug. Conveniently, I used the leftover round filter sock holder cut outs. 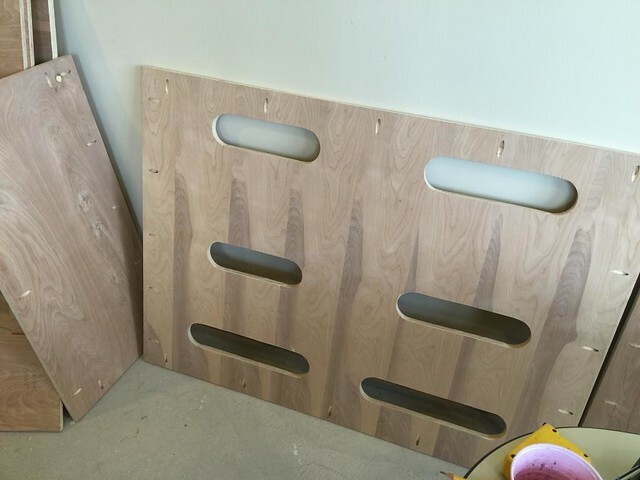 First, countersink each hole, then drilled through the counter sinks. It turns out there is minimal benefit for reducing water sound, but they make a good filter for snails and larger debris. Last edited by rmchoi; 12/29/2017 at 01:51 PM. Here are the finished sock silencers with the center overflow hole. 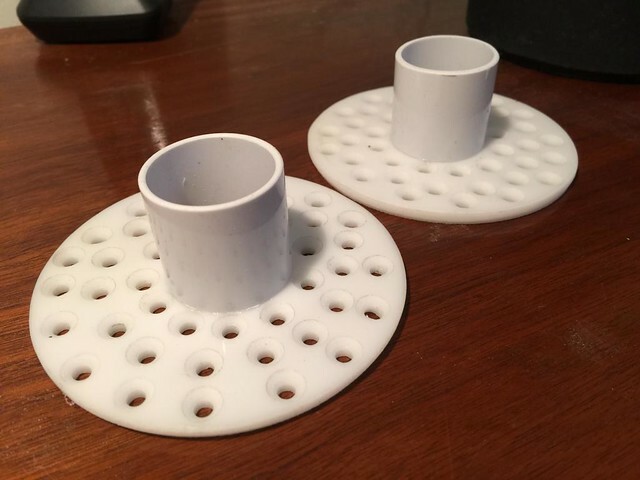 These fit snug inside the filter sock rim. The center overflow tubes are made from air conditioner drain pipe. 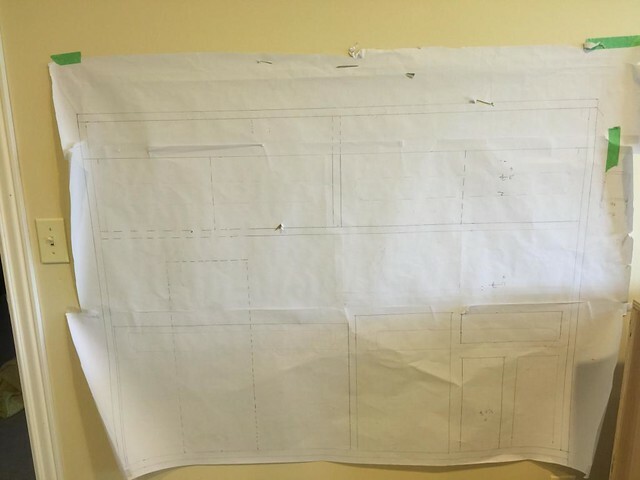 This is thin wall plastic, something like schedule 21 PVC. Last edited by rmchoi; 12/29/2017 at 01:53 PM. Here is the finished sump. Last edited by rmchoi; 12/29/2017 at 01:52 PM.